In a futuristic Road Warrior-esque world, society has broken down, and only a few cities are clinging to civilization...by a thread. In one of these outposts, Center City, ARTHUR SUYDAMs anti-heroes, Cholly and Flytrap, wisecrack their way through danger as if they were stars of a 1950s gangster movie. And, like gunslingers of lore, their reputations precede them as they try to prove themselves over and over again while becoming involved in a feud between two local power brokers and the seedy underworld of boxing. 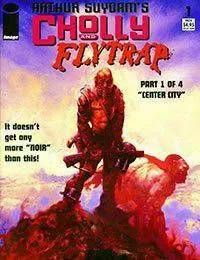 All this makes CHOLLY AND FLYTRAP a masterful, grim action adventure told with frantic pacing, tension and surprising humor.